If you need help with your kitten you're in the right place! We're all about doing what's best for our feline friends. 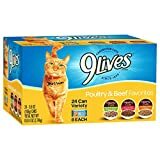 For cats who want nothing but the best – and owners who want to give that to them – 9Lives Wet Canned Cat Food is one of the best wet cat foods you can buy. Read on to discover why we love this brand so much as well as the few reasons it may not be a good fit for your cat. One thing we really love about this brand is that you have tons of choices. They have almost a dozen different options from chicken to beef to fish. If your cat is a picky eater, it’s likely you can find one that your cat will crave. Another advantage is that this wet cat food is specially formulated to work well for both kittens and cats. Many cat foods only work for one or another, which can be tricky when your cat is at that in-between age or when you have several cats eating together, all of which are different ages. This is moist, tender food that cats love. Some other wet cat foods can be drier than you’d like and feel more like dry food with gravy added. That’s not the case with 9Lives. This is tender, moist, and delicious through and through. Finally, this cat food is made from high quality ingredients. Just look at the ingredient list to see that the first one listed on all flavors is animal protein. This is a much better choice than other wet cat foods that list plant or grain-based proteins as the top ingredient. All these are reasons we ranked it number 1 in our list of the best wet cat foods. Since there are so many varieties, it’s hard to say that your cat will like them all. Many of them have large chunks that would be hard to identify as non-human food. However, others are more of a smooth, pâté style food. Some cats love this but be aware that your mileage may vary. In our experience this food can also dry up much faster than other foods do. This can be a problem if your cat likes to take its time eating. You’ll likely only want to choose this wet cat food if you have a cat who gets hungry and is ready to eat his entire meal when he’s served it. Otherwise, choose one that takes longer to get hard. This is an easy-to-find, affordable, healthy wet cat food. There are tons of wet cat foods out there for cats with specific needs but the average healthy cat will do well with 9Lives. There are tons of options to choose from, you can find it virtually anywhere, and it’s very affordable. Just be sure your cat is ready to eat when you serve it because it can get hard quickly. Copyright © 2018 · KittyCoaching.com is a participant in the Amazon Services LLC Associates Program, an affiliate advertising program designed to provide a means for sites to earn advertising fees by advertising and linking to Amazon.com · Amazon and the Amazon logo are trademarks of Amazon.com, Inc, or its affiliates.